Do you want to better your performance in running? Do you want flat feet shoes for daily workouts? You will never go wrong with the Asics Gel lyte33 3. This shoe is lightweight and has a simple design to help you achieve the best. It features excellent cushioning that enhances your foot comfort. With this shoe, you will enjoy a smooth heel-to-toe transition. FluidAxis anatomically corrects flex grooves. The upper contains an open mesh to enhance breathability. Hence, your foot will remain dry and soft even when running for long distances. The mesh also makes your feet feel cozy in this shoe. The Seamless upper construction protects your feet from getting blisters. F.A.S.T Heel in the upper section helps to reduce the shoe weight. The F.A.S.T Hell, breathable and cozy upper offers you a lovely feel. A solute in the midsole makes this shoe lightweight to suit your running needs. Also, it provides responsive cushioning. The cushion absorbs shock when your foot touches the ground. A vertical flex groove improves your gait efficiency. F.A.S.T Ride in the midsole offers you a responsive ride. The F.A.ST Drop promotes forefoot and mid-foot striking. The Deep Flex Grooves also help offer a range of motions for your foot. FluidAxis flex grooves contribute to improving your running performance. The outsole consist of (AHAR) Asics High Abrasion Rubber in the heel section. This material enhances durability, so you wear the shoe for long. The rubber sole offers you responsive while running. It also provides traction in various trails. The sole is lightweight, so you can run more and enjoy every stride. If flexibility is your choosing factor, this shoe should be on your list. It has several high-end features that make it flexible. Extra foam along the foot arch reduces stiffness. The FluidAxis corrects flex grooves to enhance your foot comfort and flexibility. The Rearfoot GEL cushioning offers foot comfort while allowing for flexibility. Additionally, lightweight upper and midsole provide you excellent flexibility. This shoe doesn’t offer you the best stability ever since it has few stability features. However, it allows you to control the foot strike while running. It has Dual Density Midsole that offers you stability and responsiveness on every step. The midsole and heel section are cushioning also help to enhance your foot arch stability. The men version weighs 6.8 oz while women’s weigh 5.5 oz. Thus, this shoe is incredibly light allowing you run long distances. Also, the lightweight nature makes this shoe more stable to suit your flat feet. The rubber sole, upper mesh and GEL cushion in the heel are the factors that contribute to lightweight. This lightweight running shoe comes in various color combinations. Men can choose either white with black and red markings. Alternatively, flash yellow with black and silver markings. Women only have flash pink with lime and green markings. Very comfortable for long distance running. Lightweight to suit running and daily training. Breathable due to the open mesh upper. Q. I’m an under-pronator. Can I use this shoe for walking? A. Yes, it is an excellent shoe for walking and running. Q. Is this Gel Lyte33 3 shoe good for the trail? Or will it wear fast? A. You can use this shoe on various surfaces. Plus it has AHAR on the outsole for durability. Q. I always sweat while training. Will this shoe accumulate bad odor? A. It has a breathable upper that keeps your feet dry and cool. Thus, you will not experience bad odors. You can control pronation issue with the best running shoes. Also, good flat feet shoes offer excellent arch support. 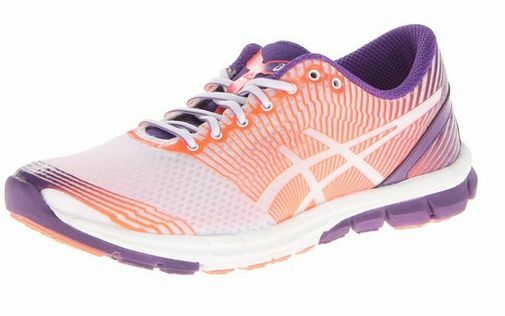 The Asics Gel lyte33 3 is a perfect shoe that helps you run well with flat feet. It helps you to control pronation and improve performance in running. This shoe is lightweight and has dual midsole density for comfort. Many runners love this shoe since it offers a smooth heel-to-toe transition.